An illustration of the proposed PleasureMed at 7715 Santa Monica Blvd., currently home to a shuttered building. The City of West Hollywood today released a list of the top-scoring applicants for cannabis licenses in five categories. Those applicants will be able to open and operate cannabis businesses in West Hollywood after finding a suitable location, getting the approval of the location from City Hall and the city’s Business License Commission and receiving a state license. Eight licenses were granted in each category, with some applicants receiving more than one license. The city’s four existing medical cannabis dispensaries were not required to apply for a new license in that category. However Los Angeles Patients and Caregivers, a medical cannabis dispensary owned by Ovest LLC, applied for and won an additional license to sell edible cannabis products on site. And Zen Healing applied for and won a license to provide cannabis delivery services. The Artist Tree was the only applicant to qualify for licenses in all five categories, which include recreational cannabis sales, medical cannabis sales, cannabis delivery, operation of a cannabis lounge offering edible products and operation of a lounge where cannabis smoking and vaping is permitted and edible products can be consumed. Its owners are Avi Kahan and Mitchell Kahan, brothers who control The Green Easy and Canto Diem dispensaries in Los Angeles and North Hollywood, respectively, and have minor stakes in California Compassionate Care Network (CCCN) and MMD. Another major player in West Hollywood’s cannabis market is likely to be PDLP JV LLC, whose Greenwolf West Hollywood qualified for four licenses, which are in the medical and recreational sales categories and for operation of a smoking and vaping lounge and a delivery service. Essence qualified for licenses in the recreational, smoking and vaping lounge and delivery categories. J&P Consulting’s Budberry qualified for recreational, edible consumption lounge and delivery service licenses. And Aeon qualified for three licenses in categories including recreational, medical and smoking and vaping lounges. The failure of the city’s four existing medical cannabis dispensaries to qualify for recreational cannabis sales licenses was a major issue at Monday night’s City Council meeting. Representatives of those dispensaries appeared before the Council to support a proposal to increase the number of recreational licenses from eight to 10. A city staff report said that would allow two of the current medical dispensaries to qualify for a recreational license, however it did not identify those dispensaries by name. The City Council moved ahead with approving the existing license process and is likely to consider in January whether to offer recreational sales licenses that would benefit at least a few of the current medical businesses. 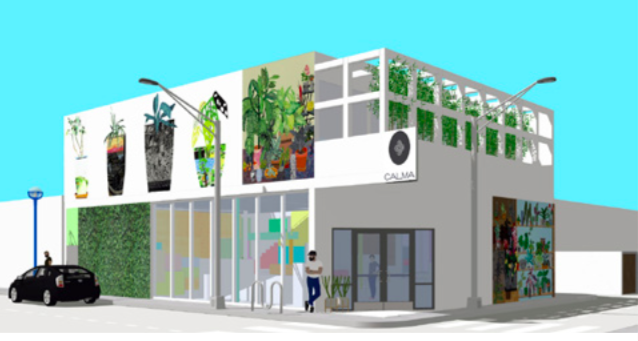 An illustration of the Calma WeHo recreational cannabis retailer at 1107 N. Harper Ave. The people associated with the companies that qualified for cannabis licenses include some well-known local business owners and operators. Jason Illoulian, whose Faring is a major real estate developer, is a co-owner with Cobby Pourtavosi of Calma, which qualified for a recreational cannabis license and a delivery license.